In the midst of all the other rumors and speculation about season 9, Coleman and Capaldi told us some things we can know about this season, before the first episode airs tonight. As River would say, "Spoilers!" (but not big ones). The Doctor shows off his guitar skills. Clara and the Doctor are getting even more “friends.” Who villain Missy (Michelle Gomez) will team up with Clara to help fight the Doctor in the show’s two-part premiere (with part 2 concluding next week). Then, later this season, Game of Thrones’ Maisie Williams is stopping by as a woman with old connections to the Doctor. That’s a lot of ladies! “Yes, Peter was quite outnumbered by us in terms of gender,” jokes Coleman. There will be Vikings. On a spaceship. “It’s my favorite episode this season,” Capaldi admits about an episode that sees the Doctor and Clara getting wrapped up in some deep space Norse naughtiness. “There’s something very comic and dramatic about guys wearing helmets with big horns and lots of fur." They'll also spend time where it’s wetter (if not necessarily better) under the sea. “We end up in an underwater base,” Capaldi says. “Which is great because every time you are in an underwater base, you know it’s going to flood at some point." 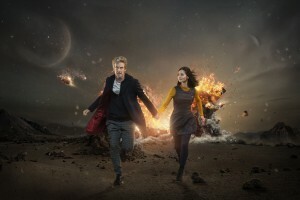 Finally, the Doctor faces one of the biggest decisions of his life in the first two episodes. And all we can tell you is that it involves the genocide-addicted Daleks and whether he should "EXTERMINATE!" someone...or something.